As I mentioned in my last post, I decided to work from home yesterday to give my colleagues a break from my coughing and myself a chance to recover. At that point in time, the sky was completely white with clouds, although there had been some blue sky early in the day. But despite the clouds, there is some sun coming from a place I can’t see, causing the trees to light up in all their autumn glory. 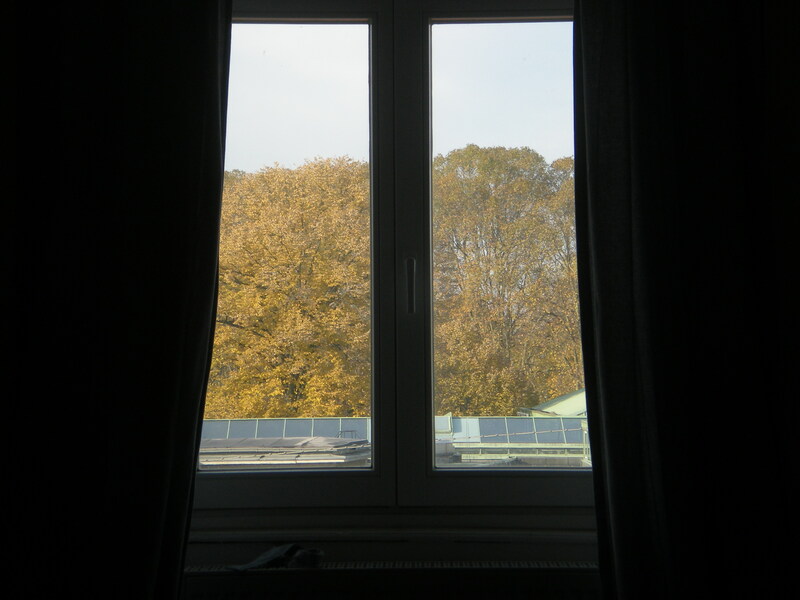 The desk in our spare room is also at the opposite side of the room from the window, but the trees are tall enough to be seen from over there. And actually, if I was to go over to the window, the view would consist of a road and tram tracks (plus some grass a little further away), so it may, in fact, be a good thing that the desk is so far away from the window. This way, I only get the nice view (plus, if I am working from home, I’m less likely to be distracted by people watching opportunities. Unless someone starts walking along the roof of the building opposite there aren’t really any people to watch!). Despite the fact that my cough was annoying me a lot, I actually managed to gain some pleasure from gazing out at the pretty coloured trees (during my lunch break, obviously. I did get some work done as well 😉 ).